Now celebrating its 31st year, Cuvée has become one of the most prestigious and largest celebrations of Ontario wine. Proceeds from the Cuvée wine weekend support grape and wine scholarships and research initiatives at Brock University’s Cool Climate Oenology and Viticulture Institute (CCOVI). Grand Tasting – 7:30 p.m. to 10 p.m. The Cuvée Grand Tasting event features tastings from 48 Ontario VQA wineries (featuring over 100 wines) and 12 sensational culinary partners – all tastings are inclusive in the ticket price. The Cuvée en Route Passport features wine tastings at 30+ wineries over the weekend – this is also included in the grand tasting ticket price or is available for purchase on it’s own. 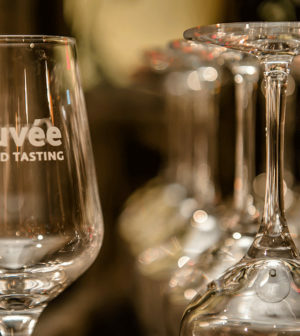 The Cuvée weekend wine experience kicks off en Route on Friday and Saturday leading to the marquis event – the Grand Tasting on Saturday evening at the Scotiabank Convention Centre. Guests of the Grand Tasting will have the opportunity to taste wines selected by the winemakers themselves as their favourite. What wine will each winemaker choose? Their selections will be revealed at the tasting. The Après Cuvée Party will keep the celebration going with dancing and will feature sparkling wine, Icewine as well as local craft beer and cider stations. To complement the VQA wine selection, guests will also have the opportunity to sample signature dishes created at live cooking stations by local and guest chefs. Grand Tasting 7:30 p.m. to 10 p.m. and Après Cuvée party 9:30 p.m. to midnight. Our mission is to inspire people to laugh, be fit, make fun friends, and experience romance through Dance. We teach people to gain confidence in themselves, not only on the dance floor but also in their personal and work life. We connect couples and singles from cross generations to live fun, fearless, and magical lives. Nothing makes our Team more happy than when students smile, laugh, hug, and embrace each other during their fun dance lessons and friendly social events. Our online and in-studio programs include Ballroom/Big Band, Salsa/Latin, West Coast Swing/Jive, danceTONE Fitness and danceFLOW QiGong/TaiChi. Download our FREE Video app at www.dancescape.com/app and start learning to dance online! danceScape was founded by Robert Tang & Beverley Cayton-Tang, former 3-time Canadian and 2-time North American Ballroom Champions, as seen on Dragons’ Den, Healthy Gourmet, ParticiPACTION’s “Get Inspired. Get Moving” fitness campaign, CTV’s “Canada in a Day” and “The Marilyn Denis Show”. #shallwedance? The Mariott on the Falls is offering Cuvée ticket holders a special room rate which can be used for Friday March 22 & 23 for $159. You can book online by going to Marriott on the Falls or call them at 1-877-353-2557. When calling, just request the special group rate for CUVEE. It also includes complimentary parking for all overnight guests. There are also some Airbnb options!